A wide selection of dishes on the menu and its skilful performance will delight any foodie in restaurant Tosno. Hotel Tosno offers cozy single and double rooms and deluxe rooms which meet European standards. Hotel Tosno was opened in 2013 and it has beautiful location on the picturesque banks of the river, surrounded by Russian nature. A journey from Moscow to St. Petersburg or a business trip to the plant in Leningrad region? Whatever the purpose of your trip you will find the genuine and friendly atmosphere and feel like home away from home. The hotel complex is located just a 3-minute drive from the downtown of Tosno, 20 minutes' drive from Pushkin and Pavlovsk and 40 minutes' drive from St. Petersburg. Conveniently located, this hotel is ideal for transit tourists, tour and business groups, gala guests of business events. The hotel comprises of 56 rooms including Economy, Standart, Junior Suite and Suite. The facilities include cozy restaurant and modern conference hall. 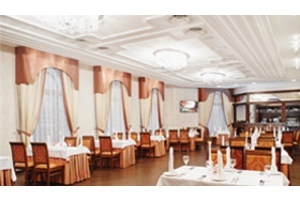 Premier hotel Tosno has everything guests need for a wonderful and comfort stay.